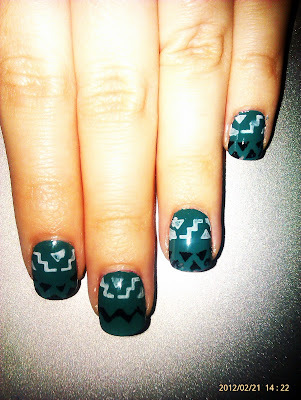 Anyway, I'm loving this seasons Aztec style so much that I have attempted an Aztec design on my nails. It was my first attempt at doing this so they aren't as neat as I'd like but I like the outcome anyway... Maybe you guys can let me know what you think. 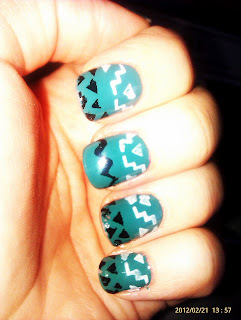 I used a stencil that is actually meant for airbrushing your nails to create the zigzag and triangle patterns. I am going to try a different style on my nails (as I am always changing them) and I will post them up soon.. hopefully they will be a little neater. Awesome aztec nails! I love the teal base color and all the funky shapes! Which colour nail polish do you own most of?